Today we were off to Ottawa for an MRI for Joel. His MRI’s can last for an hour &1/2 to 2 hours so he is sedated for the MRI. Joel has to fast going in to this, we got there for his 11am appointment and we were told they were running late, could be 2 or 2:30. Dave and I had to get creative to keep him occupied and his mind off food. He is a good boy and didn’t ask once for anything to eat or drink, he did tell us at about 2 o’clock his tummy hurt. By 2:15 he was sleeping soundly as he went in for his MRI. Tomorrow, Samuel has his 4 month appointment, we are still struggling with the decision to vaccinate or not. I’d welcome any thoughtful insight on this so long as it is shared gently. Then on Thursday, Joel and I are back up to the hospital for a blood test and to get his port a cath flushed! I think Friday if I have an energy left will be jam day. It may not sound like much but I find being away from home draining. I love home. I enjoy being here, my heart is here and I feel awful when Hannah cries, “But I need you Momma.” when I have to go. I am looking forward to the weekend when I am just home. Last weekend was busy too, on Friday night we went to a fundraiser for, “Bikers against Brain Cancer.” Then on Saturday we went to see the bikers off on their first fundraiser ride for this year. Here is Joel with Paul Poirier founder of Bikers against Brain Cancer. 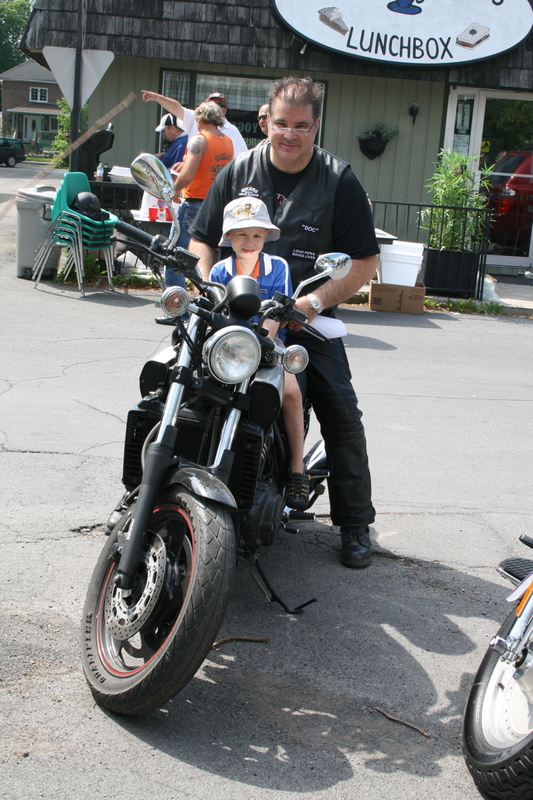 Dave and I don’t ride but felt that it was a great cause as the proceeds go to the Brain Tumour Foundation of Canada. All of the rides this year are being done in Joel’s honor.